For other uses, see Sky Tower (disambiguation). Looking up at the Sky Tower / Sky Tower lit up at night. 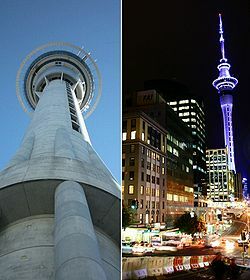 The Sky Tower is an observation and telecommunications tower located on the corner of Victoria and Federal Streets in the Auckland CBD, Auckland City, New Zealand. It is 328 metres (1,076 ft) tall, as measured from ground level to the top of the mast, making it the tallest free-standing structure in the Southern Hemisphere, and the 15th tallest member of the World Federation of Great Towers. Due to its shape and height, especially when compared to the next tallest structures, it has become an iconic structure in Auckland's skyline. The upper sections of the Sky Tower. The tower is part of the SKYCITY Auckland casino complex, having been originally built for Harrah's Entertainment. The tower attracts an average of 1,450 visitors per day (over 500,000 per year) for a variety of reasons. The upper portion of the tower contains two restaurants and a cafe, including a revolving restaurant which is located 190m from the ground, turning 360 degrees once every hour. There is also a brasserie style buffet located one floor above the main observatory level. It has three observation decks at different heights, each providing 360 degree views of the city. The main observation level at 186m has 38mm thick glass sections of flooring giving a view straight to the ground. The top observation deck labeled 'Skydeck' sits just below the main antenna at 220m and gives views of up to 82 km in the distance. The tower also features the 'SkyJump', a 192-metre jump from the observation deck, during which a jumper can reach up to 85 km/h (53 mph). The jump is guide-cable-controlled to prevent jumpers from colliding with the tower in case of wind gusts. Climbs into the antenna mast portion (300 m/980 ft heights) are also possible for tour groups, as is a walk around the exterior. The tower is also used for telecommunications and broadcasting with the Auckland Peering Exchange (APE) being located on Level 48. The aerial at the top of the tower hosts the largest FM combiner in the world which combines with 58 wireless microwave links located above the top restaurant to provide a number of services. These include television, wireless internet, RT, and weather measurement services. Fletcher Construction was the contracted builder for the project while engineering firm Beca Group provided the design management and coordination, structural, geotechnical, civil, mechanical, electrical, plumbing, lighting and fire engineering services. Harrison Grierson provided surveying services. It was designed by Craig Craig Moller architects and has received a New Zealand Institute of Architects National Award as well as regional awards. Taking two and a half years of construction time, the tower was opened on 3 March 1997, six months ahead of schedule. The tower is constructed of reinforced, high-performance concrete. Its 12-metre (39 ft) diameter shaft (containing three lifts and an emergency stairwell) is supported on eight 'legs' based on 16 foundation piles drilled over 12 m (39 ft) deep into the local sandstone. The main shaft was built using climbing formwork. The upper levels were constructed from composite materials, structural steel, precast concrete and reinforced concrete, and the observation decks clad in aluminium with blue/green reflective glass. A structural steel framework supports the upper mast structure. During construction 15,000 cubic metres (20,000 cu yd) of concrete, 2,000 tonnes (2,200 short tons) of reinforcing steel and 660 tonnes (730 short tons) of structural steel were used. The mast weighs over 170 tonnes (190 short tons). It had to be lifted into place using a crane attached to the structure, as it would have been too heavy for a helicopter to lift. To then remove the crane, another crane had to be constructed attached to the upper part of the Sky Tower structure, which dismantled the big crane, and was in turn dismantled into pieces small enough to fit into the elevator. The tower is designed to withstand wind in excess of 200 km/h (120 mph) and resist earthquakes with a 1,000 year return period. Analysis shows that an earthquake centered 40 kilometres (25 mi) away and reaching 7.0 on the Richter magnitude scale is expected to leave the tower practically undamaged. Even an earthquake measured at a magnitude of 8.0 (31.6 times more energy released than a 7.0 quake), and located only 20 km (12 mi) away, is not expected to collapse the tower. As an additional safeguard against emergencies, fireproof rooms on the lower levels of the observation deck would provide refuge in the unlikely event of a conflagration, while the stairwell itself is also fire-safety rated. 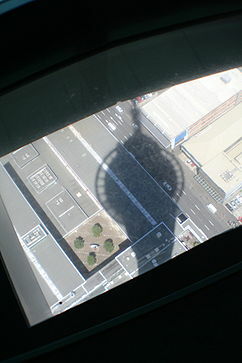 The Sky Tower has so far been closed at least once for weather-related reasons, during a storm in November 2006, when the structure started to sway noticeably in winds of up to 150 km/h (93 mph). The closure was noted as not having been strictly necessary except for visitor comfort, as the tower has been designed to sway up to one metre (39 in) in high winds of up to 210 km/h (130 mph), which are expected to occur only once in 1,000 years on average. Sky Tower illuminated in Christmas colours. Various other lighting schemes and colours are also used. Over the week ending 29 May 2009 a new lighting system for the Sky Tower was installed, utilising LED lights instead of the old metal halide floodlights, in an effort to reduce energy usage. 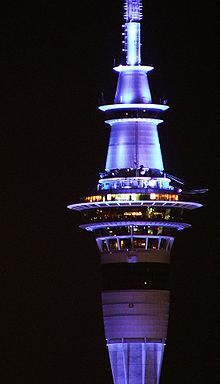 The old floodlights had been used since the Sky Tower's construction in 1997, but were difficult to modify, repair or simply change colours due to the building's height. The new lighting system is brighter, more vibrant, while using 66% less energy than the old floodlights. The LEDs also have the advantages of being able to produce millions of different colours and the ability to be controlled from a laptop, replacing the old way of manually installing filters to change light colours. This LED lights are relatively cool, using their energy to produce more light per watt than the previous metal halide lamps. They are also environmentally friendly due to their long life, resulting in better sustainability. The project had been in motion since October 2007, and on the 29th of May 2009, a rainbow display was shown to the public after sundown, after the successful trial of the new LEDs the night before. During the winter months, electricity consumption in New Zealand increases dramatically. As much of the power reserve in the country depends on the water level of the hydro-lakes, various power-saving schemes are introduced to prevent blackouts. In an effort to promote power saving, SkyCity turned off the tower lighting in Winter 2008, retaining only the flashing red aviation lights. SkyCity is also minimising façade flood lighting across its complex. Simon Jamieson, General Manager SKYCITY Auckland Hotels Group, said: "Like every New Zealander, we are concerned about the country's electricity supply, and we believe it is our responsibility to make this move to assist with the power saving request." The tower was reilluminated on 4 August in time for the 2008 Summer Olympics. 360 degrees panorama view as seen from Sky Deck, Sky Tower, Auckland. This page was last modified on 3 April 2011 at 21:07.